Did your kids have Storybook Bibles when they were babies? Did you enjoy sitting with them reading the stories of God along with wonderful pictures? My kids really enjoyed sitting and listening to the storybook versions - looking at the pictures - learning about the Truth of God. Then they got older and I started to move us to reading those stories out of my Bible. Sometimes we used an NIV, other times an ESV - and either way their little eyes would start to cloud as their attention wandered after just a few sentences. I was bummed. I knew they loved the stories, because they knew them thanks to the colorful storybooks. Yet I could not read the words aloud in a way that engaged them, at least most parts of the Bible - the phrases are long, the words uncommon and the overall message often slow in coming. With this reality in our house, I knew I at least had to give this new Bible a try. 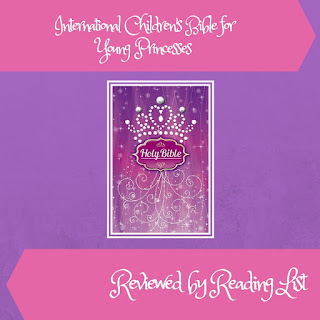 One baby girl is only getting older and two the International Children's Bible claims to be an understandable translation of the original Hebrew and Greek that is trustworthy. 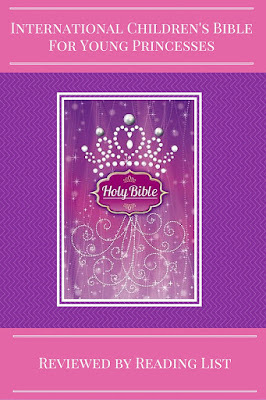 This particular Bible is purple and glitter covered and an International Children's Bible. God intended for everyone to be able to understand his Word. Earliest Scriptures were in Hebrew, ideally suited for a barely literate society because of its economy of words, acrostic literary form and poetic parallelism. The New Testament was first written in the simple Greek of everyday life, not in the Latin of Roman courts or the classical Greek of the academies. Even Jesus, the Master Teacher, taught spiritual principles by comparing them to such familiar terms as pearls, seeds, rocks, trees and sheep. It is for this same purpose of making the Scriptures intelligible that this translation was created. (See more of the goal of ICB by clicking here). There are pages to personalize this Bible - to/from, family history (think small family tree) as well as a few extra learning and instruction pages. There is a page "Why Should I Read the Bible?" that discusses the importance of building a friendship with God - "best friends" because He loves us and wants a relationship with us. Next there is a simple, but helpful, timeline of the Bible - most of the major events of the Old Testament consume most of the timeline, to help get a sense of the overall Bible, I assume. After a basic table of contents and preface on the ICB, there is a helpful, although extremely short, topical index that pulls out some popular verses. In the actual text of the Bible there are a few inserted pages: "How Do I know Jesus Loves Me? ", "Knowing Jesus Better", "How do I Pray?" and a few more. These pages include reflections for the reader as well as some Bible verses and a few places to record personal favorite verses. Throughout the Bible certain words are bold, because they are not common words, and the bold catches the readers attention to the fact they are part of dictionary at the end of Revelation. After the dictionary there is a very short index that focuses on the main people of the Bible (Jesus, Jacob, Daniel, David...to name a few). Next there is a nice break down of a few of God's promises - reflections off of verses. This is followed by a few extremely popular Life Verses for memorization. Finally, there are a few colorful sheets with the names of God, the names of the Disciples, the Miracles of Jesus, kids in the Bible and a few maps of major areas in the Bible. 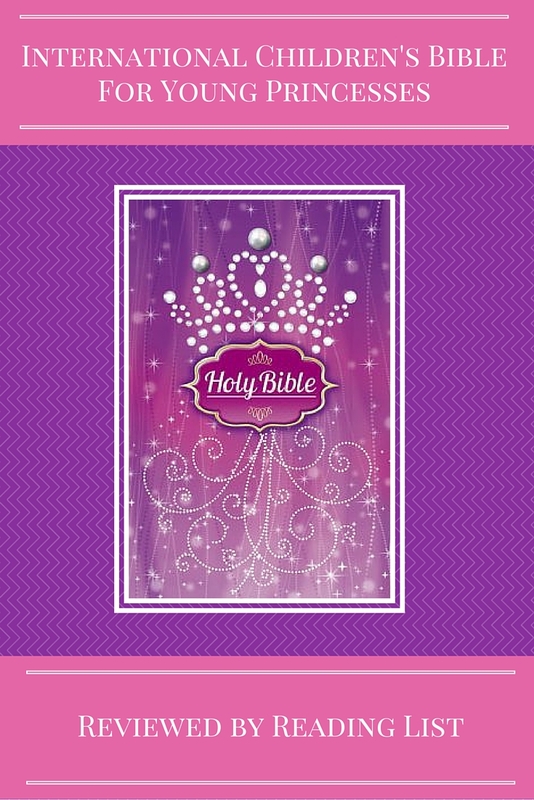 First off, this is just an adorable Bible- the cover has shades of purple that attract young girls, as well as glitter and faux pearl accents. To be honest, I was a little jealous that there are not awesome covers on my Bibles! Since it is common knowledge, we tend to gravitate towards objects that are pretty and sparkle, this cover is a win right off the bat. I knew it would be a winner with my daughter, who is still very young. I was not too sure about the ICB though, as there are some translations of the Bible that are simply not worth our time, let alone our money. So I started going through some random books checking against my ESV, NIV and KJV. There are some differences, some of the points are arranged in a different order (Ecc 3) for example. My next test was to read some large sections aloud to my husband as he read along in the NIV - just to see if the differences were worthy of concern. And yes there were differences, but they did not at all change the point of each section we looked through (1 Thess, Ecc 2-5, Matt 1-3, Gen 1-3). In fact, it read more fluidly. 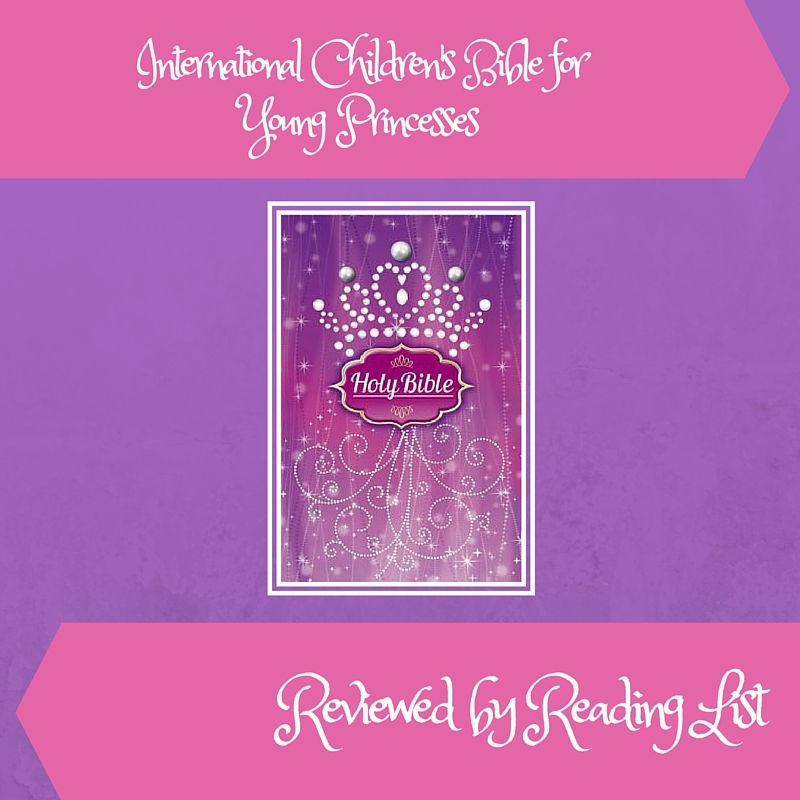 And that is why I am recommending this Bible for all of little princesses in your life. There are some great story book Bibles out there, that set up the Bible as a wonderful epic story (and it is...) and then we jump kids into the standards - NIV, ESV, KJV- and the shift is huge. The words are hard to comprehend, the phrasing is complicated and their attention wanes quickly. The ICB allows for the flow of a story book while being true the original words of the Bible. I might have to use this one to read aloud to all of my kids when we work on their Bible studies so they can stay focused enough to comprehend the message. While I am not going to start replacing all of our Bibles with the ICB, I do think it would be very helpful for kids to have access to one especially those kids younger than 13 (and for those older who struggle with reading comprehension, no matter their age). What are your thoughts on the different translations of Bibles? Have you checked out the ICB before? Would you get your child a Bible that is "pretty" or just give them a plain Bible (if money is not an issue)?